Children at Ladbrooke School enjoy learning outside whatever the weather! Ladbrooke JMI School in Potters Bar, Hertfordshire provides education for 240 pupils per day and can now offer their reception pupils outdoor learning opportunities all year round. 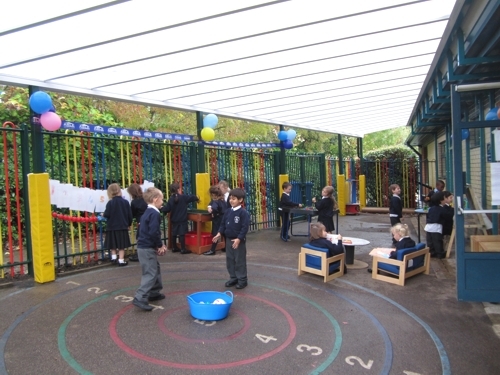 Karen Friend, the reception teacher at the school for 8 years wanted a durable, low maintenance canopy installed outside her classroom. Karen explained; “The space we wanted to cover was an obscure shape on a slope, so the product needed to be made to fit.” Able Canopies altered the design of their standard Coniston wall mounted canopy so that it followed the shape of the outside area, therefore offering optimum coverage for the class in all weather conditions. “Able Canopies came up with a great solution to transform our outdoor area which has allowed us to create a great learning environment. We could not have imagined that this canopy would have had the huge positive impact that it has to our Reception class.” continues Karen.